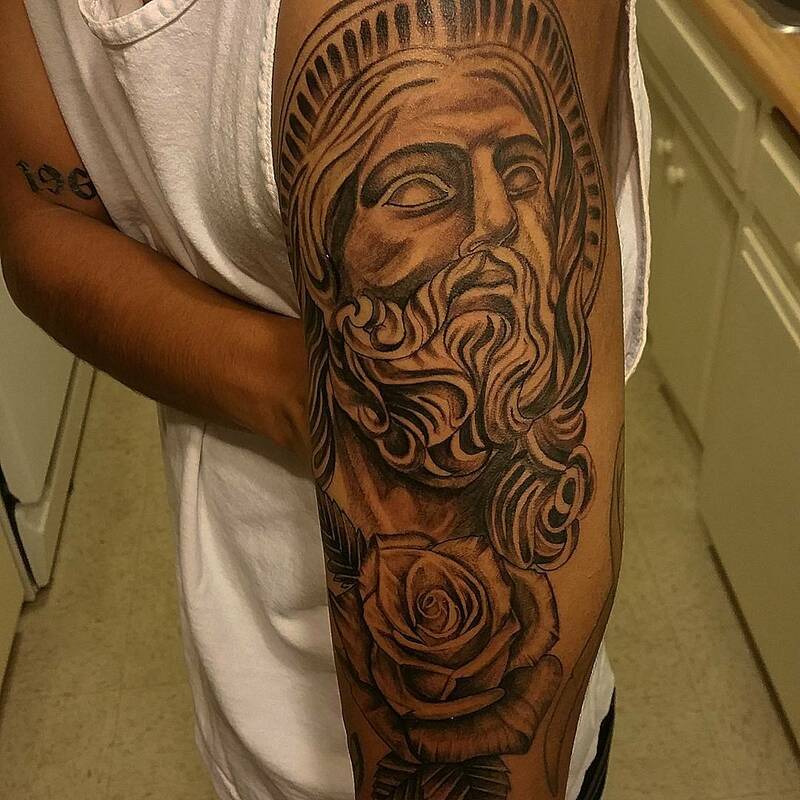 Tattoos are a great way of self-expression and reflect the wearer’s personality. People opt for tattoo designs that go with their personality type. Girls generally go for feminine designs, like flowers, fairies, angels or butterflies. Men, on the other hand, go for tough designs like animals, dragons, superheroes and the likes. A common tattoo preference irrespective of gender is that of names and alphabets of the loved ones. 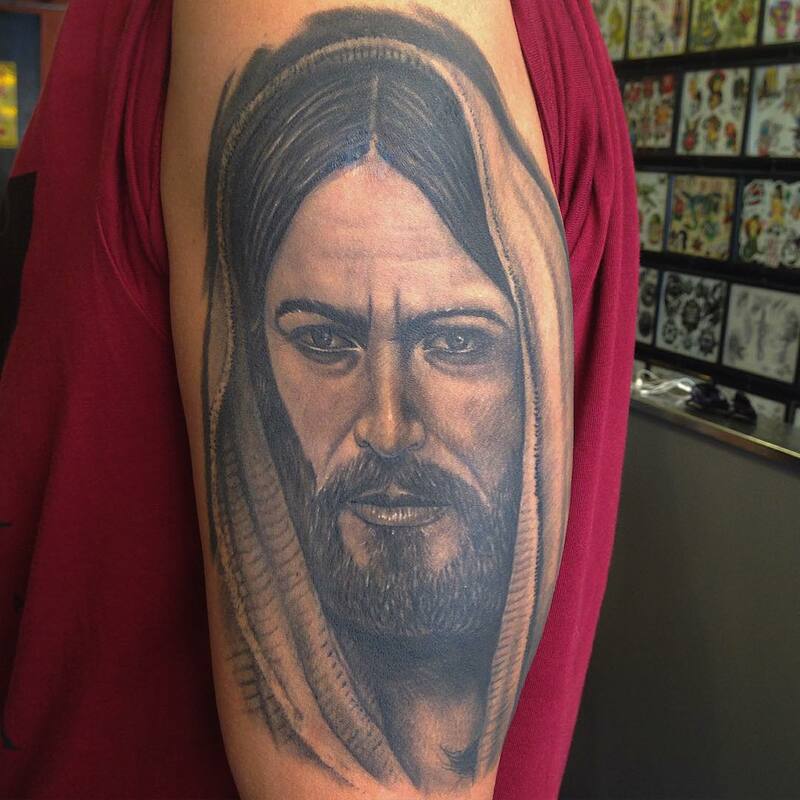 Another design that is popular irrespective of gender is the Jesus tattoo. 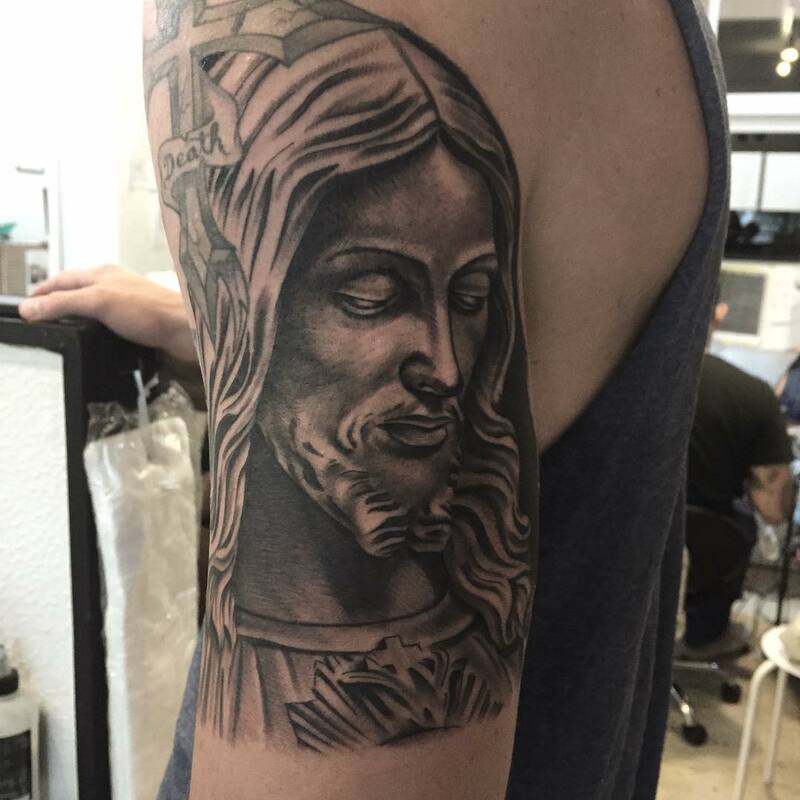 Getting a Jesus tattoo inked signifies spiritual and religious inclination. It is a way of being in sync and oneness with God. 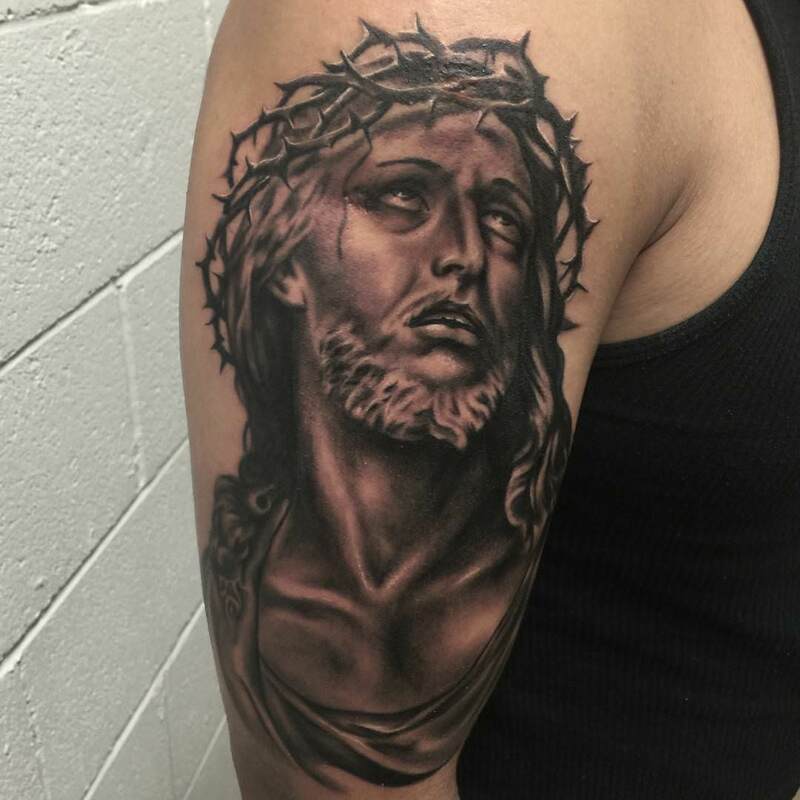 Jesus tattoo symbolizes power, faith, and belief. 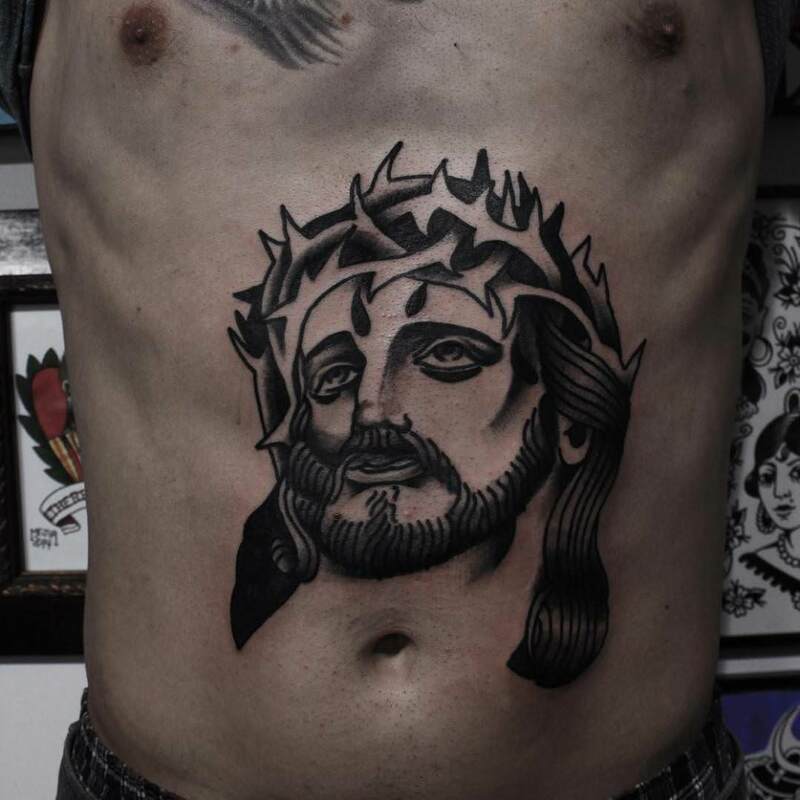 Jesus designs can be inked in many ways on various parts of the body based on size and pattern. 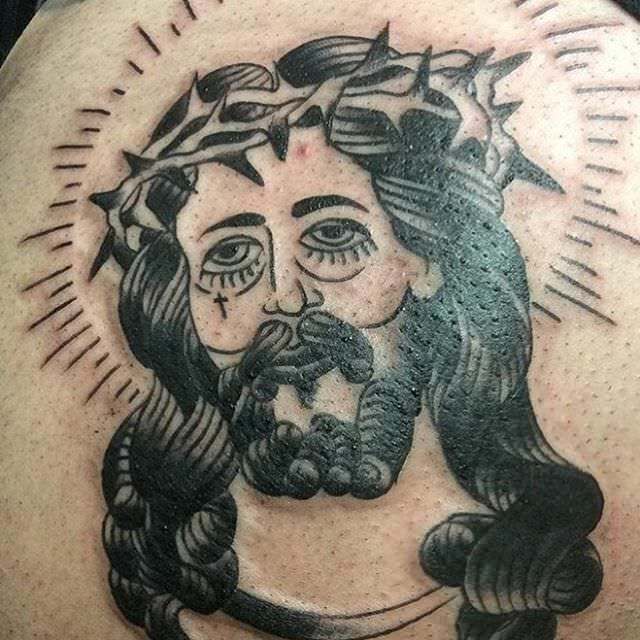 This design only has the face of Jesus inked either on back, arms or wrist. 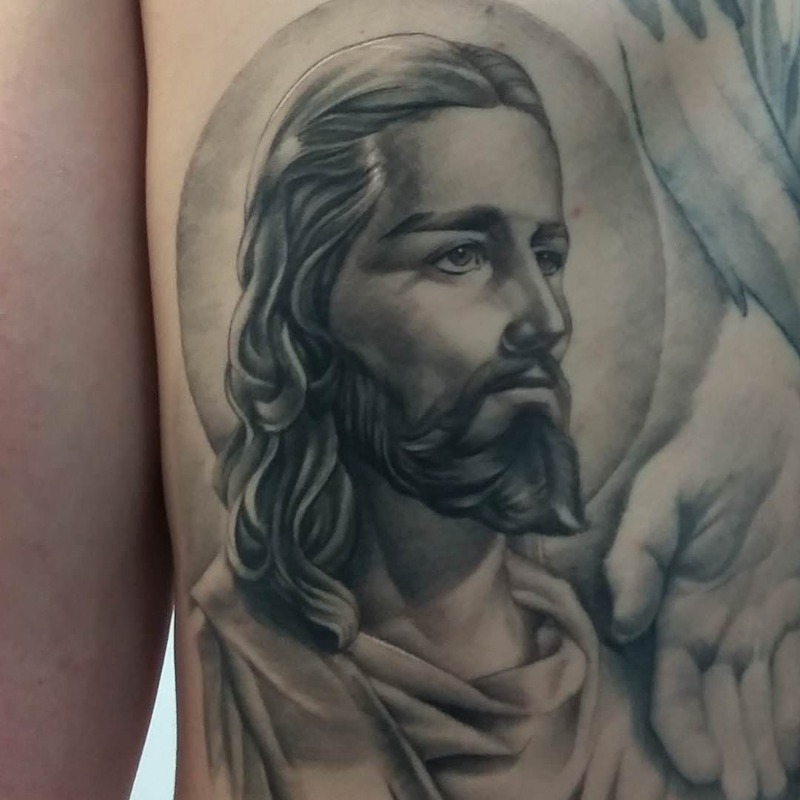 It is a plain tattoo which signifies the glory of Jesus. 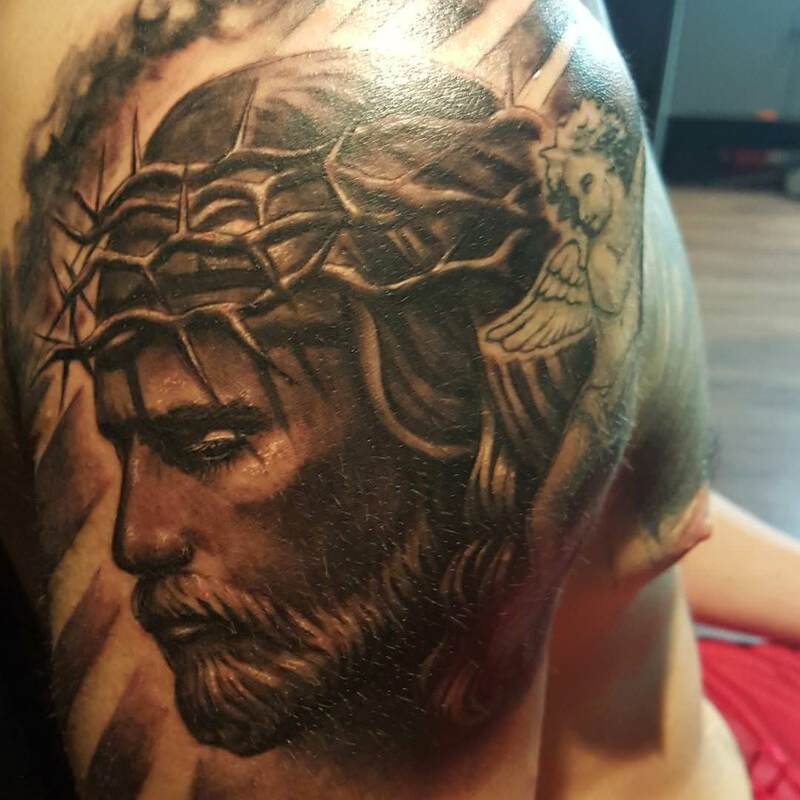 The tattoo is an appreciation and gratitude of sacrifices that Jesus made for mankind. The eyes of Jesus portray enormous kindness. 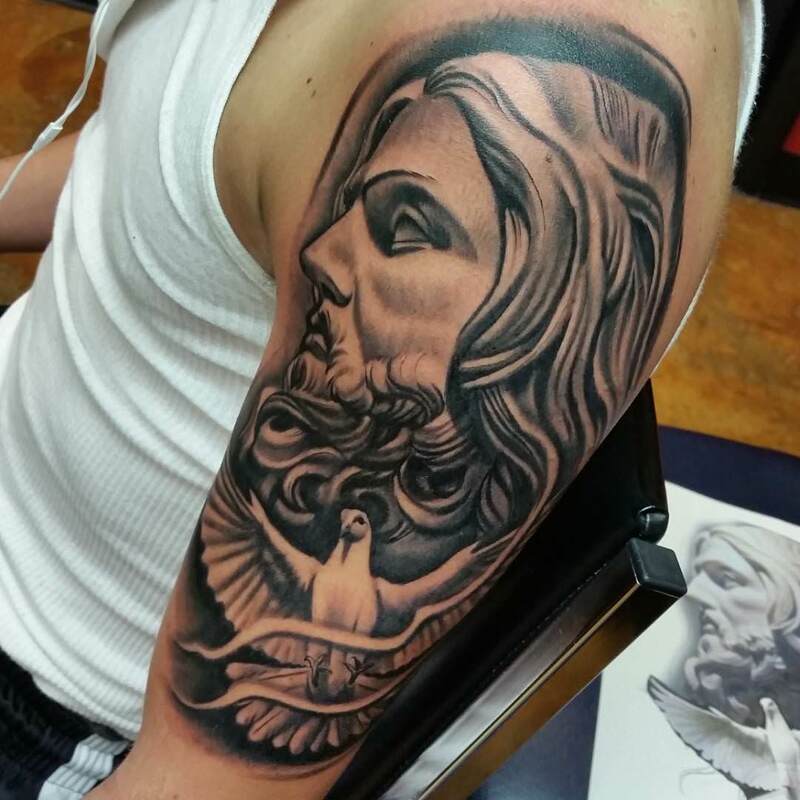 This design can be an elaborate one on the back or a small design on arms or wrist. 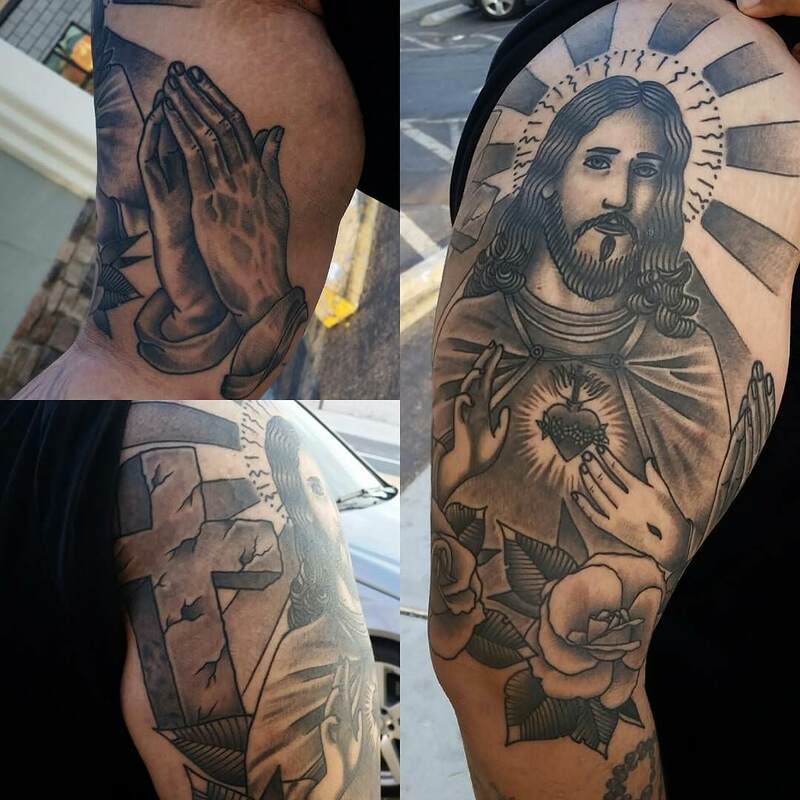 The tattoo design can have many variations with the use of a rosary. The rosary can be depicted on the hands of Jesus or with a holy cross. This design can be inked on back or arms. A small design can also be inked on the wrist. 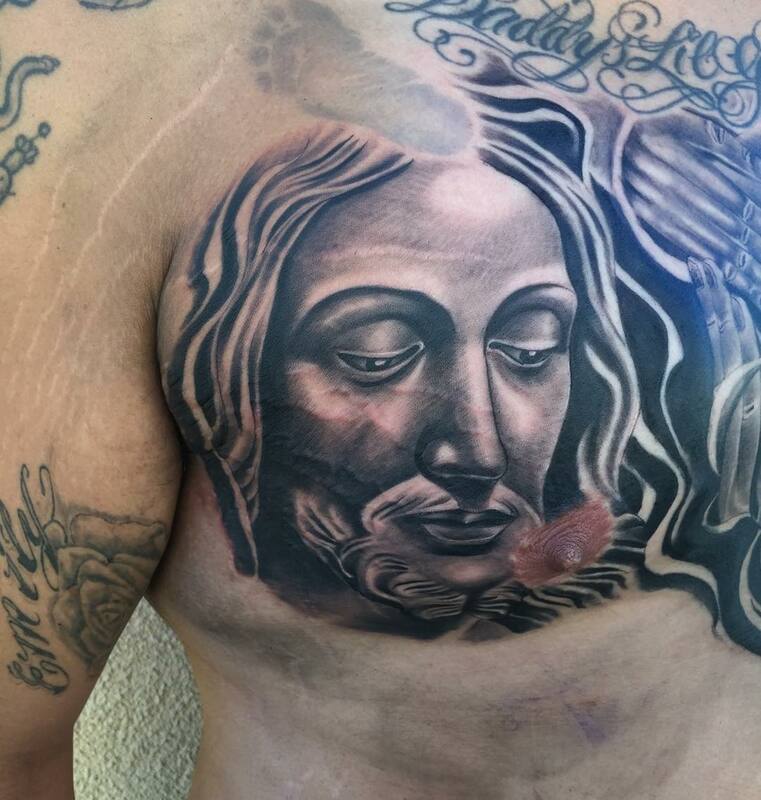 The design shows holy cross behind Jesus. 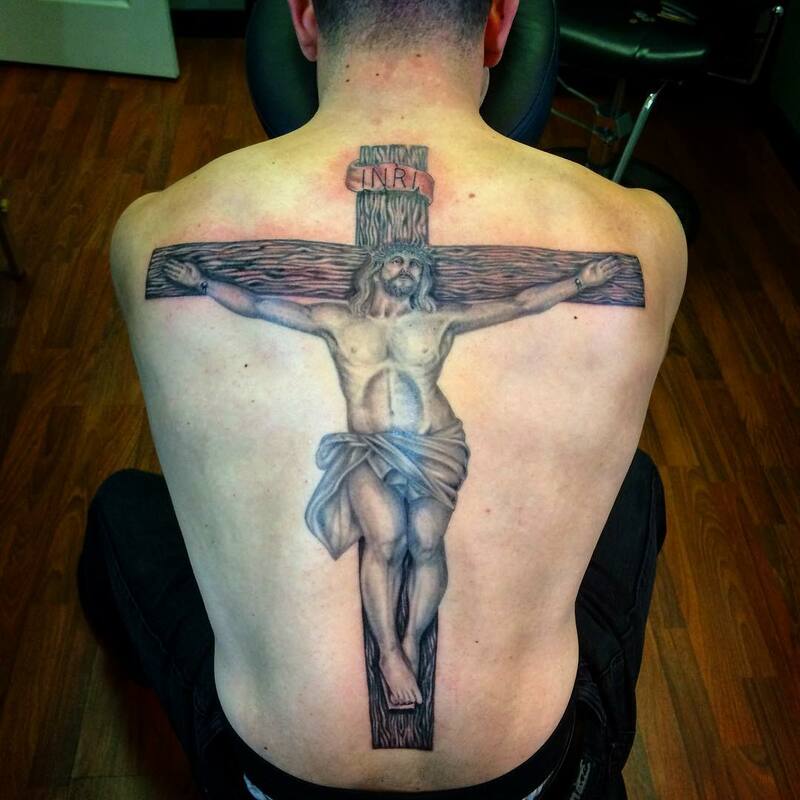 The tattoo can be inked with many variations. The holy cross with wings of angels, cross adorned with flowers, cross with thorns, these are some of the popular designs. Another unique design is that of Holy Cross with the name of Jesus. Another variation is a design of Jesus carrying the cross. The tattoos are perfect in small size on wrist or arms. 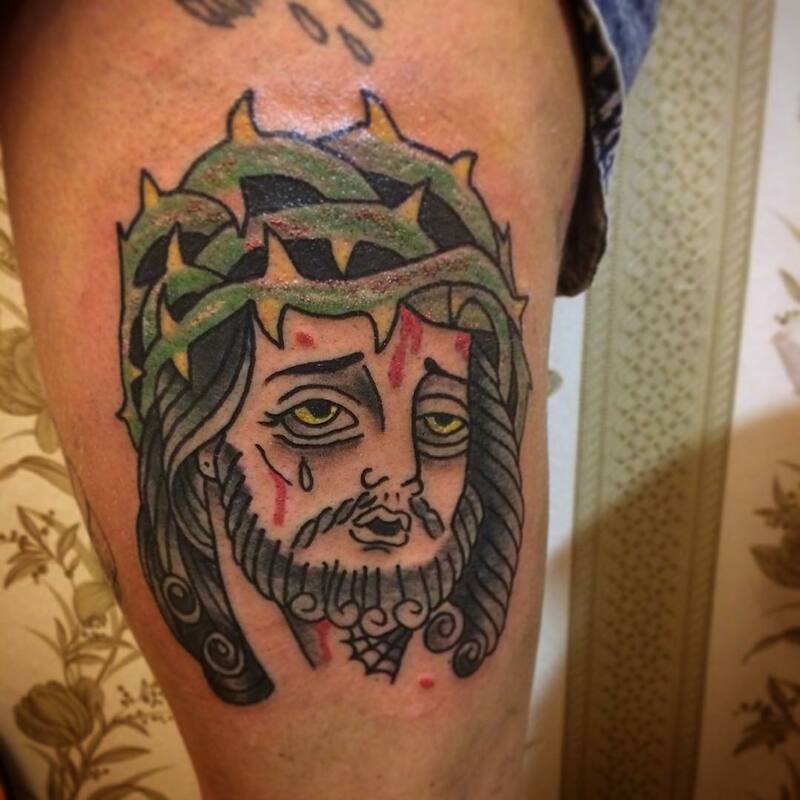 People who have supreme belief in Christianity sport this tattoo. It shows belief in Jesus and his principals, the faith and devotion. 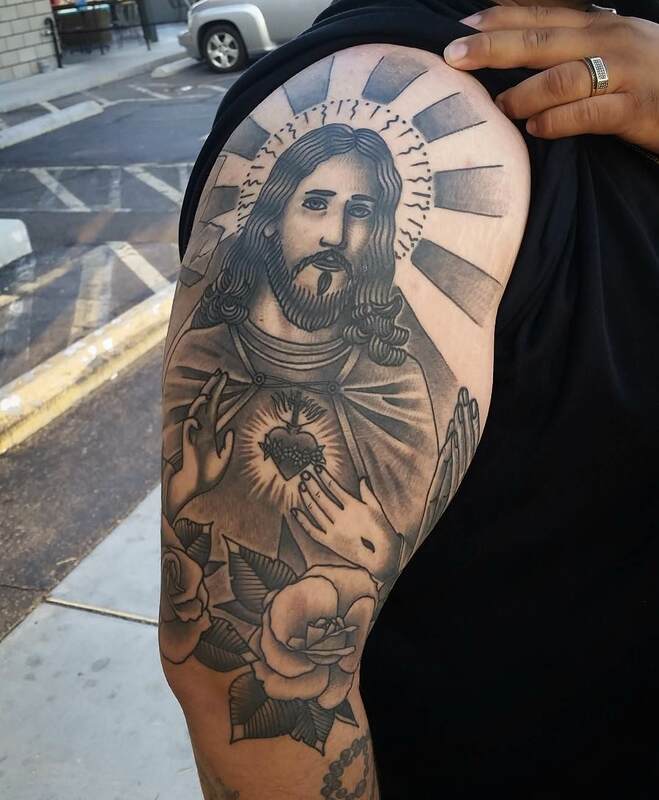 The tattoo reflects the power of prayer. 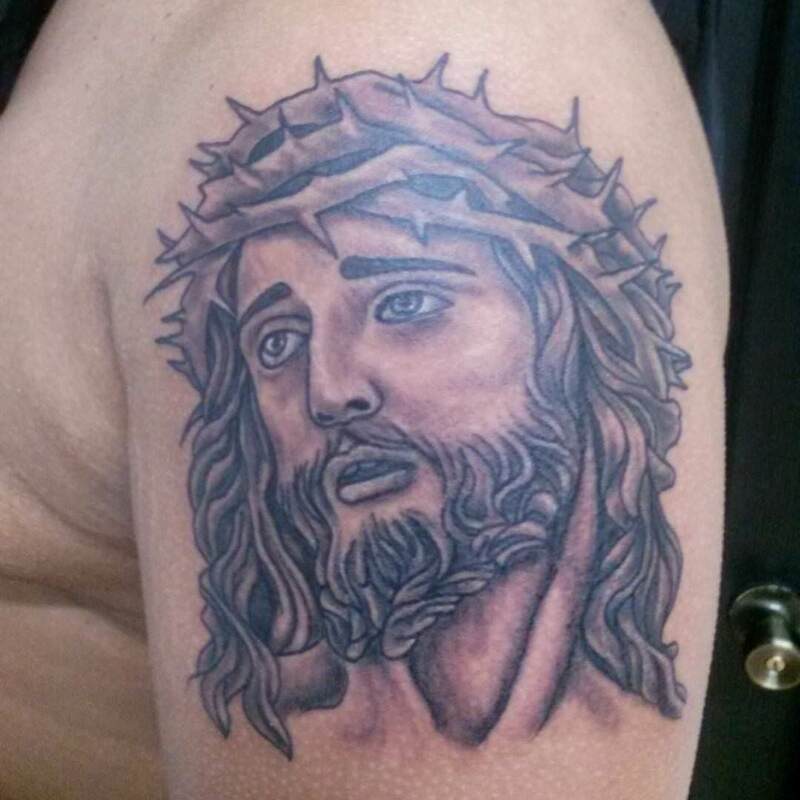 It has a special emphasis on the eyes while being inked. 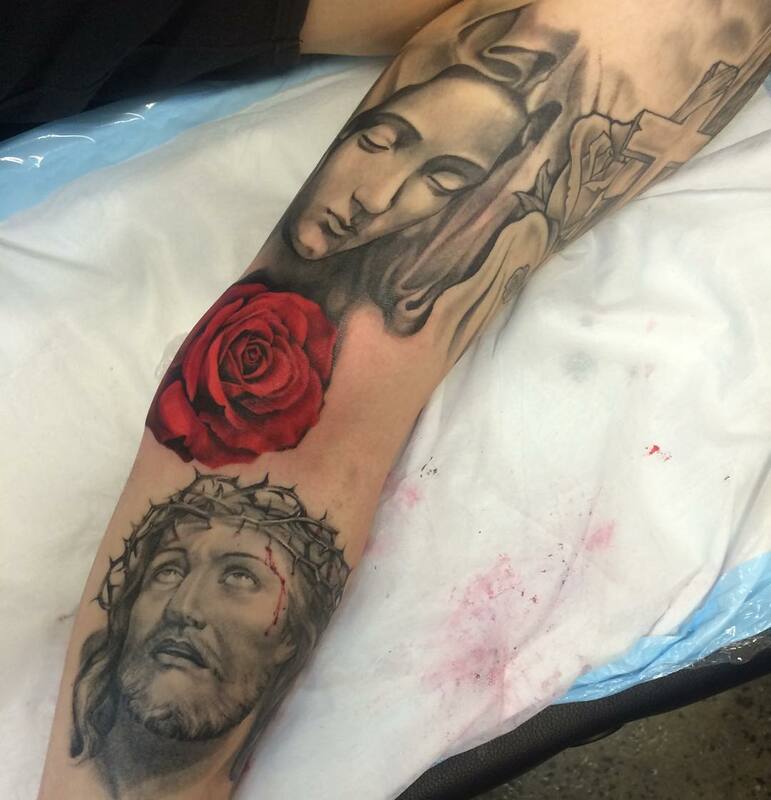 The tattoo has hands of Jesus clasped in prayers. This the most pain depicting designs of all. 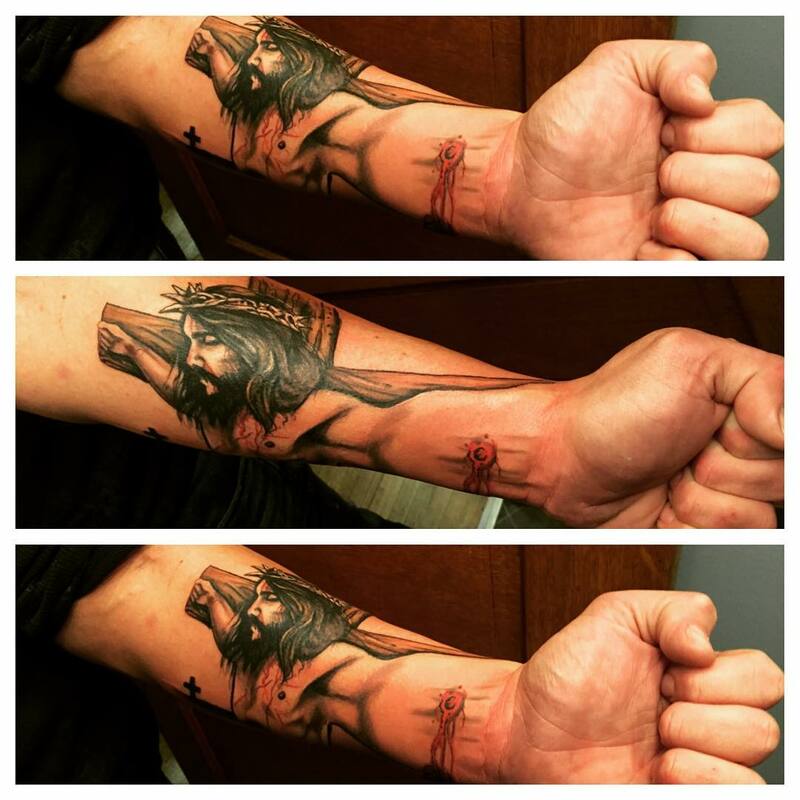 It signifies the sacrifice and pain which Jesus took for mankind. 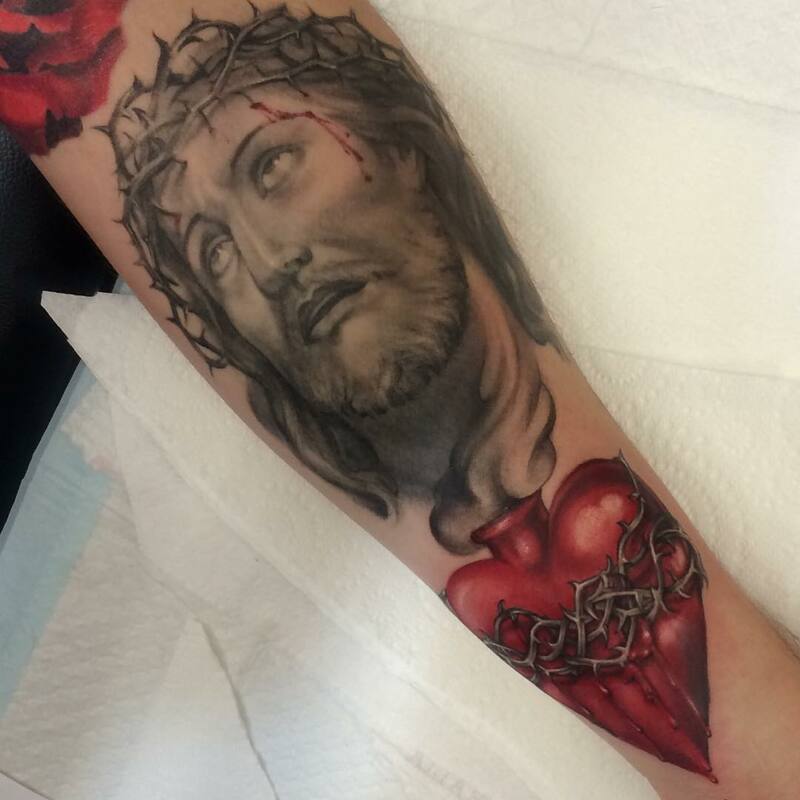 The design has blood flowing from wounds and tears in the eyes of Jesus. 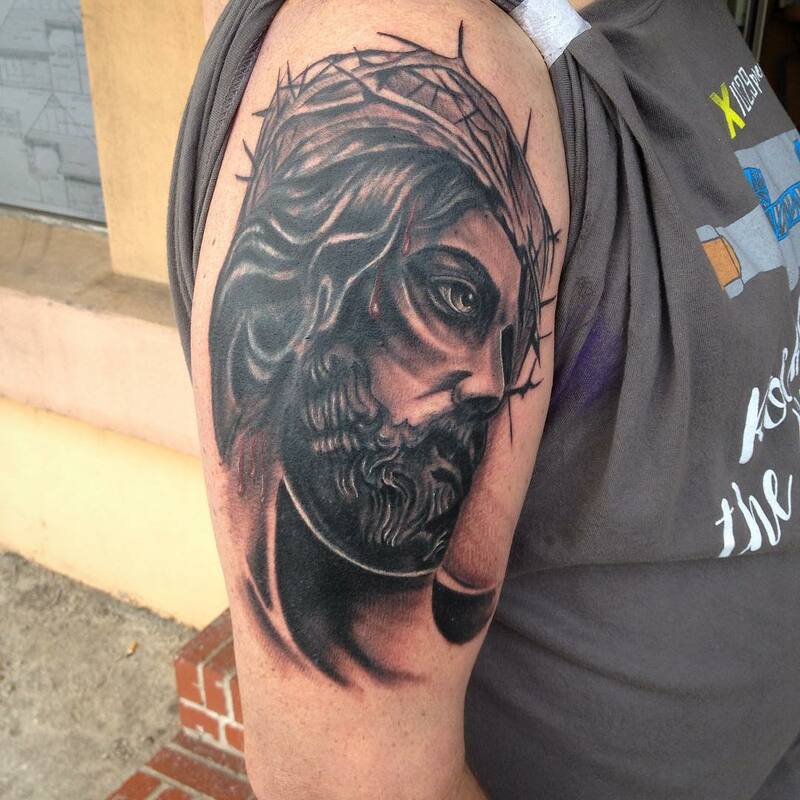 The tattoo captures forgiveness, pain, and compassion in the eyes of Jesus. 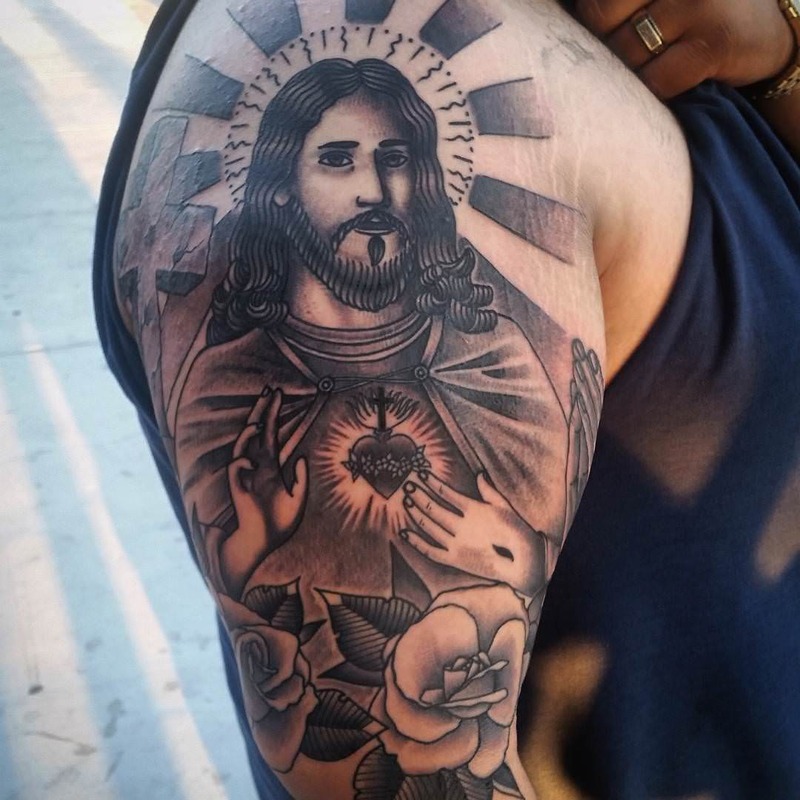 The most beautiful tattoo design of all shows Jesus Christ with Mother Mary. There are many variations in the design with the holy cross, flowers, angels, and rosary sketched in the design. It shows the compassion and love of Jesus and Mother Mary for mankind. 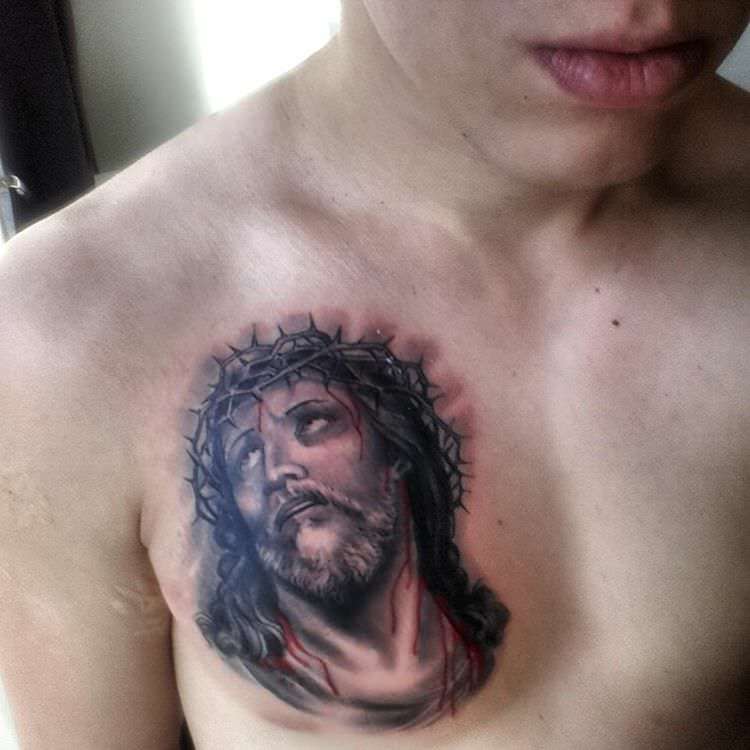 There is something touching and compassionate about this tattoo. The crucifying speaks of how Lord Jesus sacrificed his life for the mankind. 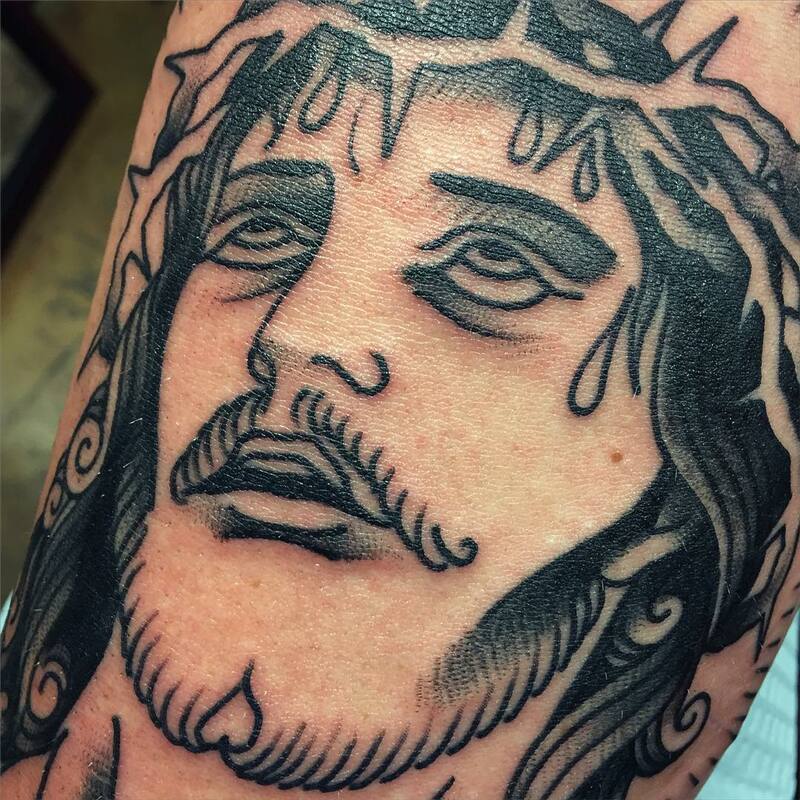 It also shows the pain Jesus bore for us. 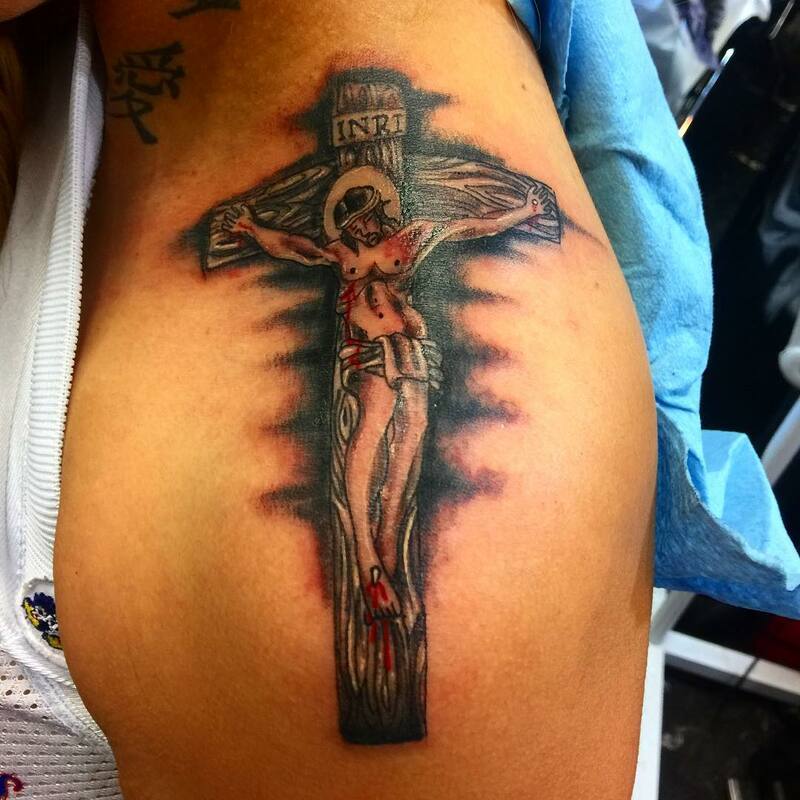 The design has Jesus hung on the holy cross. The tattoo has a background design as well. This tattoo is an elaborate one, completely appropriate for the back. 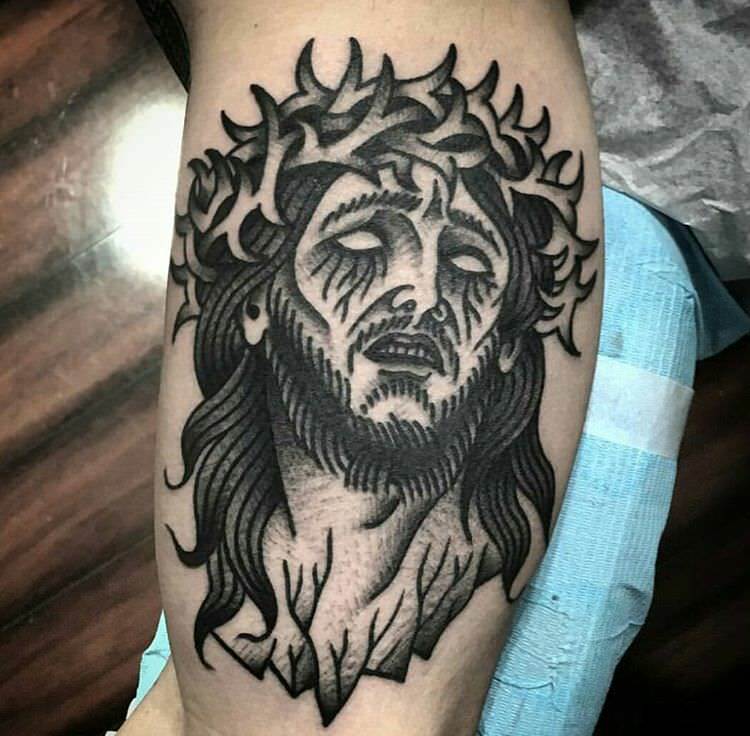 This tattoo is unique and has aesthetic appeal. It has an outline of Jesus, and the inside is filled with various patterns and designs. 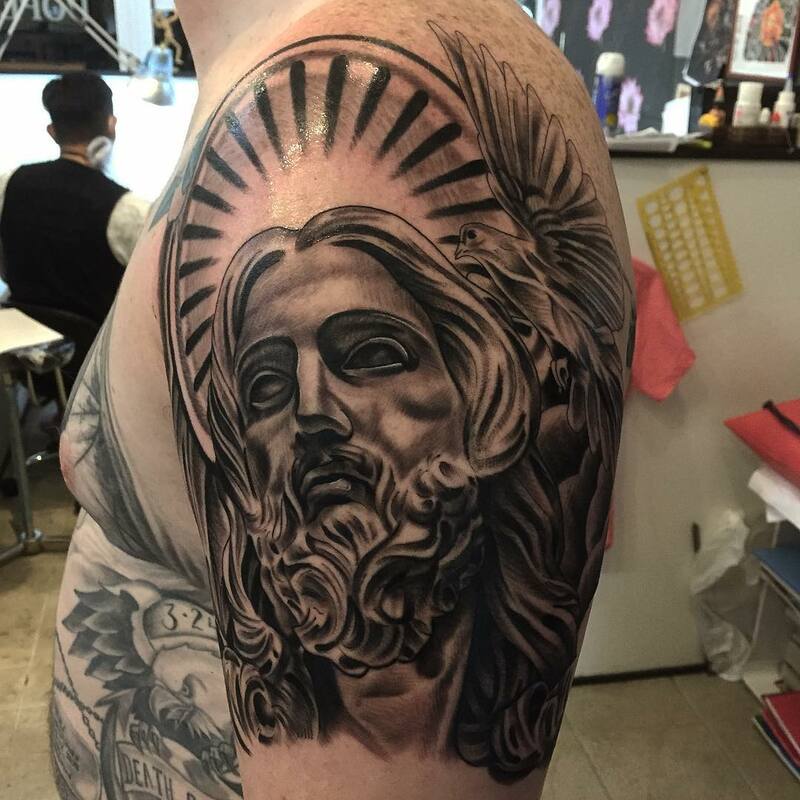 It is considered to be one of the contemporary tattoo design for youngsters. 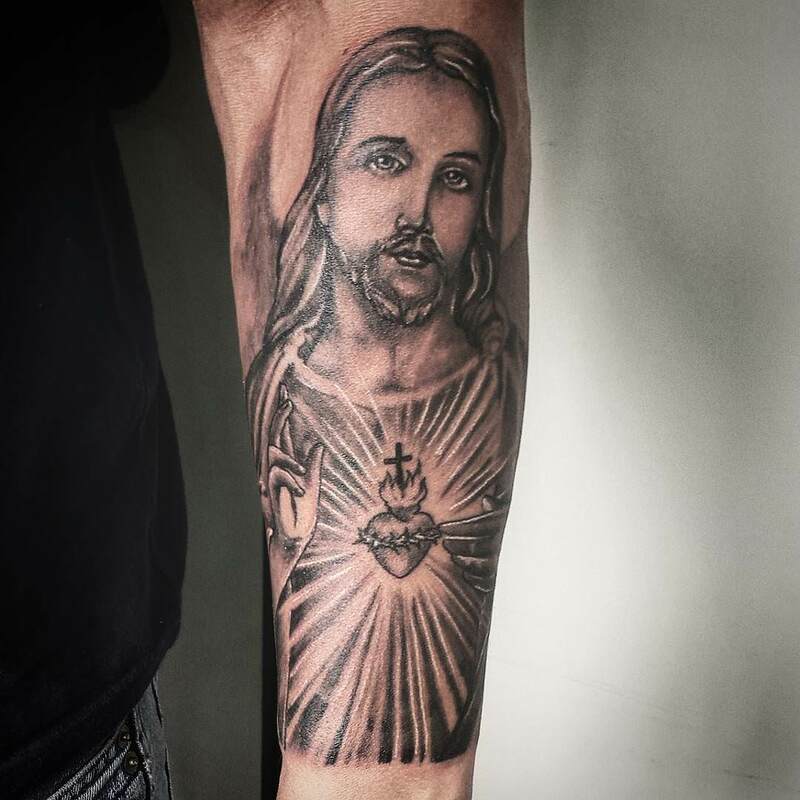 The Jesus tattoo design is a very popular one and signifies deep belief in Christianity, teachings of Bible and Jesus Christ. 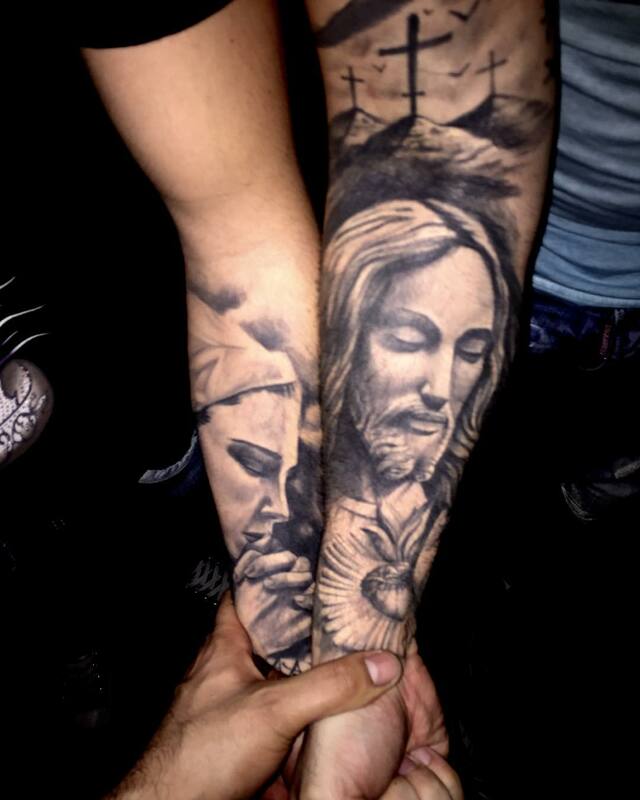 The tattoos give the wearer a sense of belonging and oneness with Lord. 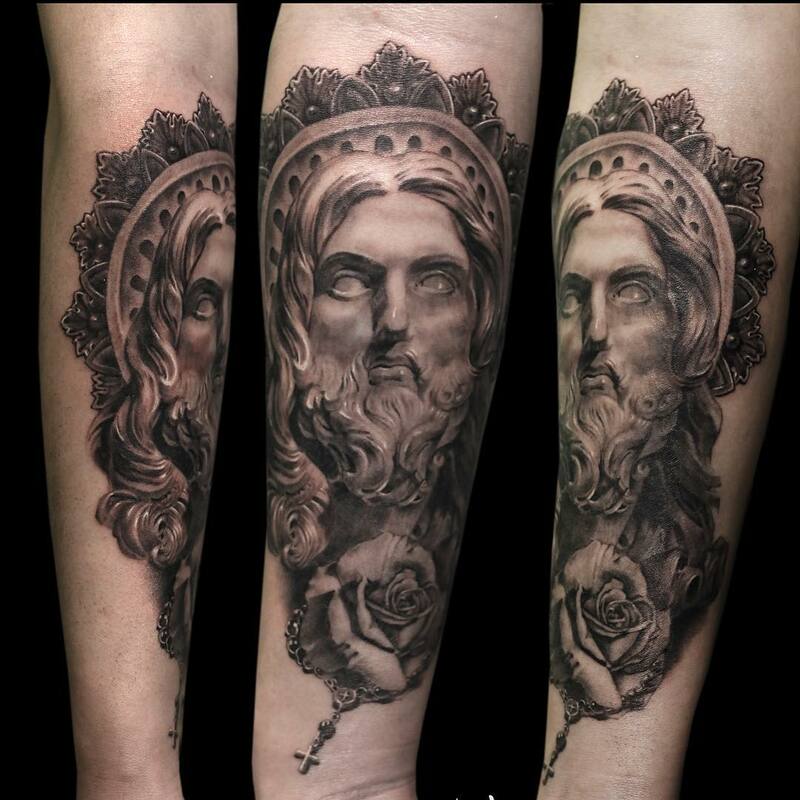 It provides strength and hope in difficult times and hence is one of the most loved designs among both men and women.